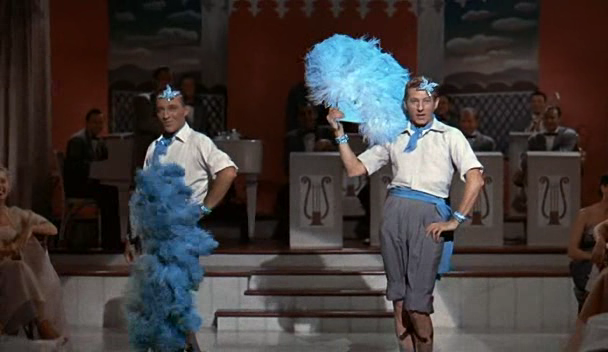 A successful song-and-dance team (Danny Kaye and Bing Crosby) fall for a pair of singing sisters (Rosemary Clooney and Vera-Allen) and follow them to their next gig at a lodge in Vermont. When they discover the struggling hotel is run by their beloved former general (Dean Jagger), they decide to help out by bringing their own show to Vermont. A perennial favorite on television during the holiday season, this top-grossing film of 1954 was directly intended to capitalize on the success of Holiday Inn (1942) (also co-starring Bing Crosby). The storyline, as in Holiday Inn, is pure schmaltz, starting with the opening sequence on a ludicrously unrealistic sound stage (meant to emulate a WWII army camp), in which Crosby immediately sings the title song (why give it away so quickly?? ), Danny Kaye quickly (and conveniently) proceeds to save his life, and Kaye capitalizes on his act of heroism by finagling a successful performing partnership. Flash-forward ten years later, when Kaye is still the more aggressive of the two (an interesting change of characterization for Kaye), and trying hard to find his buddy a romantic mate. Enter lovely Vera-Allen and Rosemary Clooney (why didn’t Clooney make more films? ), a preposterously coincidental encounter with Kaye and Crosby’s beloved former general, a busybody housekeeper (Mary Wickes) who innocently perpetuates an untruth, a faux engagement, an overall “let’s put on a show!” generosity of spirit, and — voila! a feel-good favorite has emerged. It’s hard to fault White Christmas, given that it never tries to be more than what it is — a colorful, romantic, Vista Vision vehicle for Kaye and Crosby, with plenty of song and dance routines thrown in. With that said, I’m hard-pressed to call this one a genuine “classic”, given that it never really transcends its premise or dares to try anything particularly unique. The performances are all fine, but not particularly noteworthy. Vera-Allen (now known to be suffering from anorexia) is often distractingly thin, and while her performances are as technically proficient and impressive as always, she comes across as somewhat emotionally stiff. Her best dance sequence by far is when she lets her hair down — literally! — to perform “Abraham” with John Brascia (what a treat! ); meanwhile, Rosemary Clooney gets to sing some fine ditties, and looks wonderful in Edith Head’s gowns. Irving Berlin’s score is predictably enjoyable, though “What Can You Do With a General?” remains a notorious clunker (but who’s quibbling?). Directed by Michael Curtiz. Note: White Christmas debuted as a stage musical in 2004, a testament to its enduring popularity. Yes, simply for its historical significance and enormous popularity. Must-see, for its undeniable entertainment value. Although ‘WC’ takes place at Christmastime and it features the title song and snow, you can otherwise forget it as a Christmas movie. It has almost nothing to do with Christmas and everything to do with a) the traditional idea of marriage and b) being a tribute to the armed forces. You’ll note, for example – when Crosby and Kaye first meet their leading ladies – that only a few minutes pass before the talk turns to getting married (!). You’ll also note that war is not viewed as a necessary evil but almost a preferred lifestyle (i.e, the song, ‘Gee, I Wish I Was Back in the Army’…’Gee’?!). To best enjoy ‘WC’, you will need to quickly overlook its obvious propaganda. And you can forget the plot. Yes, it’s schmaltzy – and largely ‘Holiday Inn Redux’. However, it also has a script absolutely filled with charm, thanks to the pros Norman Krasna, Norman Panama and Melvin Frank – who knew that the only way to sell a paper-thin plot is to make sure to lace it with genuine wit. (If only the producers at RKO had been hip to that when making many of the Fred-Ginger pics!) A hefty spoonful of clever sugar does indeed make the sappy medicine go down! I’m also fond of ‘The Best Things Happen While You’re Dancing’ (which is danced to perfection – with a pole-swinging Kaye!) and ‘Sisters’ (both the straight and drag versions – though, in the latter, note Crosby’s tentative enjoyment as opposed to Kaye’s quick, non-self-conscious abandon – he is having way too much fun here; hmm…). Apparently reliable Robert Alton handled the dances – aided by an uncredited Bob Fosse (!). Whoever did what, the very impressive musical stagings appear to be non-stop – or at least there always seems to be another one coming at you before you know it. I can’t claim to be a big Irving Berlin fan, but those involved in the film put commendable energy into making every song as memorable as possible. Curtiz mixes everything seamlessly. It’s as if he’s saying, “You want entertainment? I’ll *give* you entertainment!” Even if you can easily forget some of the slight ingredients, chances are you will not forget for a minute that you are having a wonderful time.